The vast majority of canister vacuum cleaners sold today come with a HEPA filter, but what exactly does this do? This is probably something that many people have wondered and is something we hope to clear up here. For starters, most people know that a HEPA filtration system is a good thing to have which is why most vacuums do come with it but it hasn’t always been that way. These types of filters are built of a mat of randomly arranged fiberglass fibers between 0.5 and 2.0 micrometers in diameter. The diameter, thickness, and face velocity are the main factors in determining how effective it is at trapping those microscopic organisms that would otherwise pass right through and back into your home. What is HEPA and HEPA Filters? It has been shown to produce a noticeable drop in symptoms for allergy sufferers and asthmatics, too. These are very difficult for traditional filtration systems to capture, and are also the ones that can cause problems with those who have allergies or asthma. The process where the dust and dirt particles following a line of air flow pass near a fiber and stick to it. Where larger particles cannot avoid the fibers as they flow along the air stream and become embedded directly into them. The amount is affected by the air flow velocity and amount of fiber separation. This is the result of the smallest particles colliding with gas molecules in the air to slow their path through the filter. The increases the probability that the particle will be captured by one of the two processes listed above. Allergies are on the rise everywhere. In part, they are being diagnosed more than before, which is good news, because now sufferers can take action against them. Our homes are a major source of allergens, from chemicals in flooring to our beloved pets. 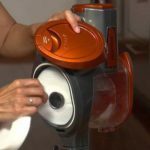 Now, your vacuum cleaner can be a great asset in your fight to diminish your sneezing, sniffling, watery eyes, and all the other ways your symptoms strike. 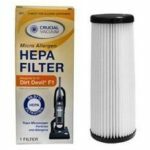 When shopping for a HEPA canister vacuum, some make the filters standard equipment, while other brands or models offer HEPA filters as an option you can purchase and attach. If you find a model you love in all other respects, but only offers HEPA as an option, have your cake and eat it too by purchasing the filter. Also, now that you know a little bit about how these filters work, you likely want to buy a canister vacuum that is equipped with it. While most of the reviews we have on this site are for models that are equipped with HEPA there are some standouts in terms of filtration, suction, and overall performance. You maybe interested on the best canister vacuum for allergies & asthma sufferers. Miele canister vacuums are among the highest rated cleaners you can find today. 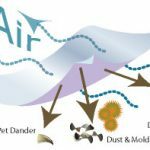 Their filtration is among the best in the industry at removing allergens like pet dander, mold spores, and dust mites. The combination of their Air Clean™ filters as well as their HEPA filter means the air in your home is much cleaner than before you started vacuuming. Their dustbag also automatically closes upon removal so you do not get any escape of dirt like you will when you use bagless models. Dyson canisters have tremendous suction due to their unique design. Their Root Cyclone™ technology keeps the air flowing through without any chance of clogging which greatly increases their efficiency at capturing the smallest of particles. One of the biggest problems vacuums face today is a loss of suction due to dust settling inside the pathways. Anyone who has used a Dyson knows just how much power they really retain. A good model of Dyson canister is Dyson Big Ball Multifloor. SEBO canister vacuum cleaners like Airbelt D4 are not designed like your typical model at all. They have an Air Belt design where the belt not only provides a soft bumper for protecting your walls against damage but also to rotate air around the vacuum during use. Their microfilters combined with a fully sealed design and HEPA filtration system keep suction at a maximum while capturing virtually all of the microscopic particles from the air. They are highly recommended for those with allergies or asthma. It is important to read the instructions for the filter when you buy a unit or just the filter. If buying a used vacuum that does not come with the instruction book, instructions for care are usually available online. Some HEPA filters can be washed. Others can be turned around for double life expectancy. Others must be replaced periodically. Visual checks on a monthly basis are best. Some advanced HEPA canister vacuum cleaners will have an indicator light when it’s time to change or wash the filter. For most units, the visual check works, of course unless your ears, nose or throat begin to tell you first! HEPA filtration is the same sort of technology used in medical air filtration units. It’s great to know that you can do something positive for the environment in which you and your family lives while doing the regular chore of vacuuming. Go HEPA for greater health and comfort!